The refugees arrive, some kissing the ground of the inﬁdels, while in gratitude trading minaret calls for bells. Who are the Syrians but those who care, those who are the innocents persecuted, wanting to raise their children, love their spouses, care for their elders, desiring merely to have hope and live their lives unmolested by tyranny and unmolested by religion? Why are their faces, actions, humanity, so familiar to us? ls it because they are so much ourselves? 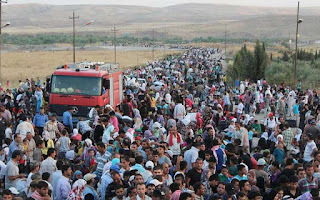 They risk danger from drowning, murder, leaving behind homes and property, seeking safety and freedom in secular lands. Will these freedoms be denied in these countries, by other religions? Isn't there something familiar about them? Think about it. They are the Canaanites ﬂeeing God’s Israelites in the Old Testament, even as they are being slaughtered while shielding each other and their babies. They are the humans described in another Old Testament story as, "wicked humanity whose thoughts were bent upon evil at all times," drowned in the Flood. They are those trapped between religious factions, desiring nothing more than they be allowed to live their lives in peace. They're the innocents killed by Christian Crusaders and Moslem Warriors alike. Look at them: They were and still are, average humans ﬂeeing religions that refuse to let them live unmolested by dogmas. They are the same caring, loving, peaceful, harmless, innocents who are destined to be slaughtered and damned in the New Testament End Times. They are caught between the Hard Place of hell on earth and the indifferent Rock of Ages. the pleas of mankind rose low and high. Why, screaming and whimpering prayers went piercing the sky. and looked on in silence and did nothing at all. And still he does nothing at all. millions are shot, their bodies pushed into pits, or into ovens are shoved. Praise is wasted on mans’ creation, "God" who drags us down, pits us against each other. Instead praise us from whom our blessings ﬂow. Because there is no Other. in vain invoke a God of "love." Always his eye is on the tragic sorrow. he listens to each fading voice as it falls beneath a pall. he does nothing nothing at all. 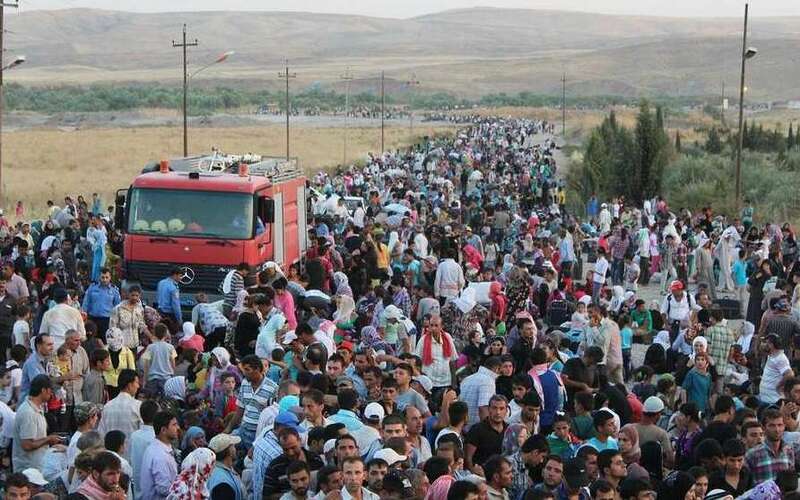 Who are the Syrian refugees‘? They are humans. They're the good, some not so good, humans, just like all humans with all our faults, cares, and desires. They are you and me. The evidence is in front of us: There is no Allah, God, Christ, Yahweh, or any other god, there. When push comes to shove, there's only us, helping one another.